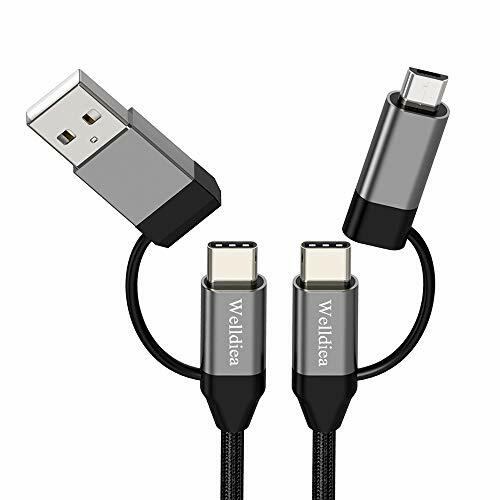 Welldiea the USB type C cable is nylon braided design,the most powerful and durable materials are used in our factory.There are four functions are grouped together on the type C cable,It can be used as USB C to USB C cable, USB C to Micro USB cable, USB A to USB C cable and USB A to Micro USB cable.Each use of the four supports data transfer and power charging at the same time. USB C to USB C Cable is one meter, supports safe high-speed USB power delivery up to max 45W(15V/3A)accordance with USB Type-C specifications version 1.1. Other applications of the USB type-C charger cable supports high-speed charging (max 5V/2A) and fast data transfer (480Mbps).This 4 in 1 USB C Cable is far more dependable and valuable than others in its price range，so buying the cable that fast charging all your USB c devices and your android devices,saving money and time. Whether you lie on the couch or sofa and use your devices while you are charging at the same time,or you use freely in your bedroom, office and even in the backseat of your car.Whether you have android devices, Type C devices, or even have a hard disk,you can rapid charge and data sync at the same time, power delivery up to max 45W(USB C to USB C),data up to max 480Mbps. If you have any questions about this product by welldiea, contact us by completing and submitting the form below. If you are looking for a specif part number, please include it with your message.